Wokker is a modern cuisine food truck with the ideals to cumulate the flavors and aromas of Houston into unique dishes. Our goal is to hand craft flavors and ingredients from traditional Asian dishes and meld them with good old fashioned Southern Cooking, focusing primarily on Texas BBQ and comfort foods. The result is spices and cultures that blend harmoniously, like they’ve always belonged together and ultimately developing unique flavors in a way that is seldom done. The evolution of Houston’s cuisine is inevitable. The ideals of our company are much more than your average food truck. Wokker aims to create the perfect dish that delivers our message in one bite: This is Houston, always growing, always changing, but always delicious. 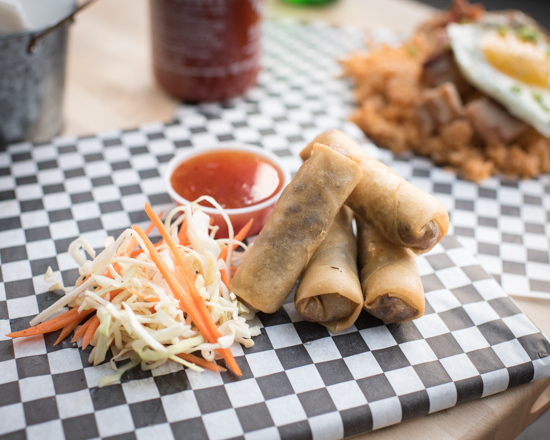 Slow smoked brisket in tangy BBQ Sauce rolled into a crispy egg roll. Served with a side of Asian slaw and Thai chili sauce. Crispy Brussel Sprouts, Carmelized Onions and Pickled Golden Raisins, Tossed in Daishi vinaigrette. Topped with Bonito. Asian inspired Chicken Nuggets, Crispy Fried Onions and Jalapenos, tossed in our House Cajun Spice. Sauce for dipping. Fall off the bone Pork Ribs glazed with a Spicy Garlic Tamarind Sauce. Served with a side of Curly Fries. Loaded Curly Fries topped with chopped Slow Smoked Brisket, Cheddar Jack, Spicy Mayo and our Tamarind Sauce. Bourbon Glazed Pork Belly Served over Kim Chi Fried Rice and topped with a Fried Egg. Thinly Sliced Slow Smoked Brisket with a Tamarind Glaze. Served over Rice Noodles, bean sprouts, onions, and Cabbage. Finished with Green Onions and Peanuts. Cubed Filet Mignon in a sesame soy marinade. Tossed on the Wok with Onions, Tomatoes, and served on a bed of fluffy white rice. Garnished with pickled onions and topped with a Fried Egg. Crispy Breaded Chicken Steak on a bed of white rice. Drizzled with our Smoky Tankatsu BBQ Sauce and a Fried Egg. At our brick & mortar (907 Franklin St) we offer the full menu as shown above as well as these exclusive items. We Still Wok the Streets of Houston Too! Check here for our Food Truck's Schedule!